The kitchen is at the heart of the home so it makes sense that it be warm and inviting. If modern technology and clean lines are important to you too, you may have trouble coming up with a design that works. We love this beautiful kitchen space because it is both modern and warm. The rustic wood floors add a tremendous amount of warmth to an otherwise cold kitchen. Stainless steel and bright white cabinets keep the space modern and clean. Softer accessories like the wicker chairs and whimsical painting complete this comfortably modern kitchen. Getting the rustic flooring look you see here is easier than you think. There are many hardwood flooring options available that give you the worn and weathered look without waiting years for it to happen naturally. 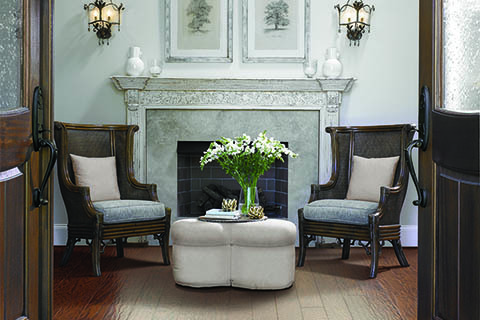 Rustic River Hardwood is a great brand to look at. The hardwood styles in the Rustic River collection feature unique markings, hand scraping and weathering to give you that cozy, lived in look. If you’re in need of a more budget-friendly floor, you may also be surprised to find that a laminate floor or even vinyl can give you that same cozy look. Grafton from the Laminate for Life line. Canova from the EarthScapes line. What do you like most about this rustic, modern kitchen?